No sooner did news of Square Enix publishing LostWinds: Winter of the Melodias in Japan come out that now we have news of yet another title coming to the Japanese WiiWare service courtesy of the RPG giant. WayForward has just announced that Square Enix will be publishing their LIT WiiWare title in Japan under the name School of Darkness on December 22, 2009. You can check out the press release snippet below for more information on the upcoming Japanese release and don't forget to check out our own review of the game if you haven't already. After captivating gamers in North America, and PAL territories, WayForward’s LIT will travel to the far east courtesy of Square Enix® Co., Ltd. as School of Darkness. Releasing on December 22nd, 2009, School of Darkness includes all the content from the North American release, as well as the enhanced control scheme of the PAL release. School of Darkness will be available for download via Nintendo WiiWare™ for 1000 Wii Nintendo Points™. School of Darkness has been rated “B” by CERO for ages 12 and up. For further information on School of Darkness please visit www.schoolofdarkness.com. School of Darkness is a 3D horror puzzler set in a dark high school overrun by creatures. 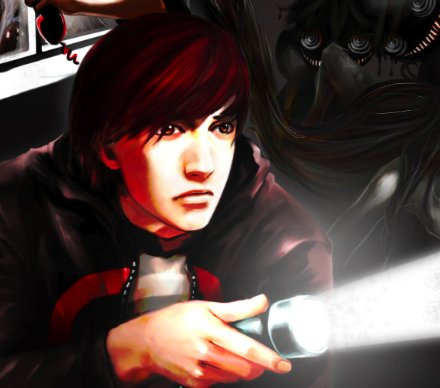 The game follows Jake, a below-average student and the game's protagonist, as he makes his way through each classroom, utilizing what light he can find to create safe paths across the darkness. Jake's objectives are to escape his school and reconnect with his girlfriend, Rachael, who uses the school’s phones to keep in contact with him. School of Darkness combines environmental puzzling with horror combat and boss battles to create a uniquely unsettling Nintendo Wii™ experience. It would seem that Square-Enix is on a roll with their WiiWare publishing, so it will be interesting to see what they have up their sleeves next. We'll keep you posted on any new developments. Fun little puzzler that often reminded me of Silent Hill. Still haven't bought it, but i know i will, sooner or later. I love how S-E is starting to publish great western titles in Japan. For example they released Modern Warfare 2 last week, and it actually did really well! @3: Wait, what? Square Enix publishing an FPS? And it's an Activision game? GDTHNDSAVHIMBDSVBBQ. i prefer LIT name, more concise.